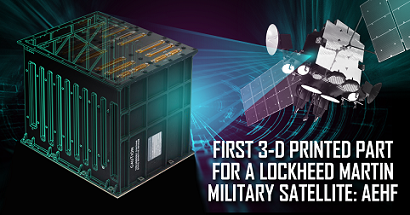 April 5, 2017 – When the U.S. Air Force’s sixth Advanced Extremely High Frequency (AEHF-6) satellite launches into space, a 3-D printed part will be along for the ride. A Remote Interface Unit, an aluminum electronic enclosure designed to hold avionic circuits, will be the first 3-D printed part certified for use on a Lockheed Martin military satellite. By going from multiple machined parts to one 3-D printed part, the team was able to save time in the design and production cycle, as well as increase the quality and consistency of the units. The lead time for manufacturing the part went from six months to only 1.5 months, with assembly time also being reduced from 12 hours to just three hours. AEHF is a global military satellite communications system that provides protected, assured communication for strategic commanders and tactical warfighters. Lockheed Martin will deliver the fourth AEHF vehicle in 2017. AEHF-5 and AEHF-6 are in production and are on track to launch in 2018 and 2019, respectively. The qualified part onboard AEHF-6 was built using a process called Laser Powder Bed Fusion additive manufacturing, in which a laser melts and fuses aluminum metal powder layer-by-layer to build a part based on a digital design. The electronic enclosure will serve as a model for use on other programs that are designed using the A2100 satellite bus. Across Lockheed Martin, 3-D printing is used for design prototyping, tooling and the production of affordable components. The company produced the first 3-D printed parts to fly on an interplanetary spacecraft, Juno, which is currently orbiting Jupiter, and a 3-D printed part flew on Orion’s first flight. Additionally, technicians are qualifying large 3-D printed fuel tanks for the modernized A2100 satellite bus.